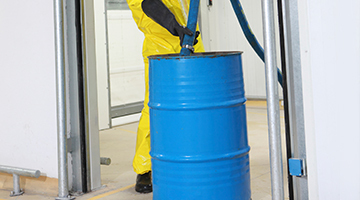 A food processing or beverage plant’s washdown areas are unique environments that undergo harsh abuse from pressure washer sprays and a multitude of chemicals used in the cleaning and sanitation of equipment. Flooring in chemical washdown areas requires heavy-duty flooring solutions that can withstand these conditions. Moreover, washdown floor coatings must support strict sanitation protocols to ensure the safety of produce, meat, dairy and other processed food. Whether a plant has one or multiple food production washdown areas, our technical representatives can help design-build the best flooring system for each application. Chemical washdown areas in food production facilities are a critical component of a plant’s compliance with regulations from the FDA and other governing bodies. 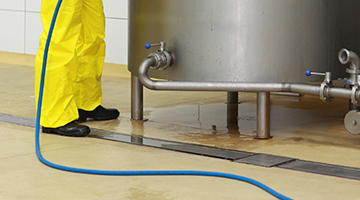 Because food can easily become contaminated with bacteria and other pathogens, chemical washdown flooring areas must meet some of the strictest sanitation protocols in the food and beverage industry. The typical process of cleaning equipment begins with pressure washers. Since equipment must be carefully sanitized, pressure washing must be done at close range, generally within 6-8 inches, allowing for chemicals to be disbursed throughout the washdown area. Because the chemical washdown process eliminates bacterial, washdown areas are of vital importance to the operation of any food or beverage processing plant. A well-performing heavy-duty polymer flooring system must withstand the harsh environment of these critical areas. Florock’s broad line of high performance chemical washdown and food processing floors contribute to the sanitary environment crucial to the success of any plant. Our antimicrobial flooring systems can help prevent contamination of foodstuffs and contribute to safeguarding the health of the consuming public. Protect consumers and plant personnel with USDA compliant heavy-duty flooring systems from Florock. Contact a technical representative to learn more about our flooring systems for food and beverage production facilities.